At Dyersburg Skin and Allergy Clinic, there are two different ways that we can test you to determine whether or not you have allergies. The first is by a simple blood draw and test called RAST (Radioallergosorbant Test). The second is called SET (Skin Endpoint Titration) – Skin Testing. RAST has the advantage of being quick and easy. It has a high specificity, which means that it can identify patients who are NOT allergic. Sensitivity is lower with RAST, which means that there may be a higher rate of false negative results. This means that you could be allergic to some substances that would be more easily determined by skin testing. There is also the advantage that you do not have to stop taking antihistamines if you are RAST tested. In patients with severe allergies, it may not be advisable to stop antihistamines, even for a short period of time. Blood will be drawn from the vein. RAST cannot be performed with a fingerstick. This will simply not be enough blood to perform the test. After having your blood drawn, you should expect your results to be in within a week. You may have a follow up appointment scheduled, or you may receive a phone call with results and to discuss further treatment measures. Suspected allergens will be added to the blood sample sent to the lab. IgE is a specific type of white blood cell called an antibody that is produced in response to exposure to allergens. There are some types of IgE that are allergen specific, which means that they are only produced in response to specific allergens. For example, there is a specific type of IgE that is produced in response to dust mites. If the patient is allergic to a substance, they will produce the allergen specific IgE and it will be detected in the blood sample. A series of technical procedures are performed that will then allow technicians to measure the amount of allergen specific IgE that is present to determine whether or not an allergic response is being mounted. The test results will be numerical for each antigen. The higher the numerical result, the greater amount of allergen specific IgE is present in the blood. This will mean that you will be more sensitive to those allergens. 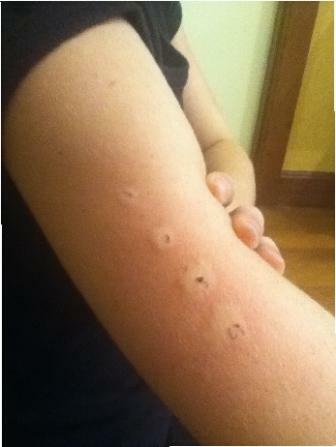 This type of testing, intradermal testing (skin testing) is more sensitive. This means that there will be fewer false negative results. 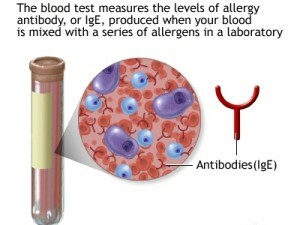 If you are allergic to something, it is more likely that skin testing will be able to determine this. One of the down sides to skin testing is that you cannot be tested if you are taking a medication called a Beta Blocker. This will interfere with some of the life saving measures that will be taken if you are to have a severe allergic reaction called anaphylaxis. You also cannot be taking antihistamines prior to testing as this will interfere with the results. We do not perform SET on patients younger than 5 years of age. It is also more difficult to perform this test on patients with urticaria (hives) or with a condition called dermatographism. You will be scheduled for two separate appointments, each lasting about an hour and a half to two hours. It is easier to perform the test if you wear short sleeves or something sleeveless as the test is performed on the upper arms. You will receive a list of medications to avoid prior to testing. On the day of the test, you will receive multiple very small injections under the skin. We will be injecting antigens to which you may react, then measuring the skin response. The injections will be given in increasing concentrations if there is no reaction until it is determined whether or not an allergic response is elicited. Positive responses are increasing wheal formation with increasing concentration of antigens. Antigens to which you are allergic will then be mixed by a specific formula based on the test results and immunotherapy (allergy shots) may begin. This entry was posted in Allergy on 10 December, 2013 by Dyersburg Skin and Allergy Clinic.